In Episode 68, we spent some time talking about all the ways the bad guys can try to target the elderly online and over the phone. This week, we’re running all the way down to the other end of the age spectrum to look at the ways troublesome bad actors might target your kids. We’ll also discuss how these nefarious rogues may set their sights on your children as a way to target you, the parent, as their endgame. Our goal with today’s episode: to have a productive conversation with you as a parent, a friend, an educator, or just as someone who takes privacy seriously and cares about protecting children on the Web. As with last week’s show about the elderly, though, our goal today isn’t to scare anybody — we want to get people thinking about the ways kids can be targeted, and what we can do about it. Is monitoring software right for your family? It’s hard to avoid the presence of social media in daily life today — from heavy hitters like Facebook and Twitter to sites like Tumblr, Pinterest, and many others; in many ways it defines the pulse of the modern Internet. Everyone is using it, including kids. When Facebook first got off the ground, membership was extremely limited — by its very nature you practically had to be 18 or older to make an account. Ultimately, after some years, it expanded to high schools, and then to the general public, transforming into the massive media platform it is today. Along the way, Facebook decided to set the bar at 13 — that’s the age when Facebook considers a child “old enough” to create an account. In some areas, this age limit can be higher, but in general, Facebook chooses to use the guidelines established in the Children’s Online Privacy Protection Act from the late 90s. Children younger than 13 are not “supposed” to have accounts, and creating an account for a child is a violation of the Facebook terms of service, but it does happen. The result is a site populated by users of an incredible age range, but sharing broadly the same levels of access. There are plenty of good reasons for kids to want to be on the site, of course — not only talking with friends but connecting with family, too. It’s hard to deny that Facebook is one of the easiest ways to stay in touch with people today. To that end, the company recently announced that they’ll be publishing a special version of their Messenger app designed specifically for children. They understand the desire kids have to make these online connections, but also recognize the need to do it safely. Parents will be able to configure Messenger Kids to allow messaging between approved contacts. This way, you can easily set it up so that your child can safely communicate with friends or family, but not with random strangers. While this may be a shrewd business decision on Facebook’s part in a world where apps like Kik and Snapchat are hugely popular with young children, the company did also note in its announcement that they won’t undertake any ad-related activity or monetization with Messenger Kids. Will that last for the long term? We’ll have to wait and see on that count. It’s worth asking “Is my child old enough for the Internet?” While they might experience a “sandboxed” Internet through apps such as YouTube Kids or even Netflix’s kids-only version, getting out onto the wider web requires more thought first. We’ve covered some of the considerations you’ll need to make there on previous episodes, and we’ll touch more on how to have transparent and open talks with your kids about computer safety further on in today’s episode. While the computers they use at school, the library, and perhaps even at home will be monitored and perhaps content-restricted, that won’t always be the case — especially with smartphones. Knowing how to handle these dynamics is essential. Because there are tons of chat apps and community-focused projects out there today, it can be a little overwhelming to try and keep track of things. Some of these apps seem to explode in popularity overnight after coming from nowhere. As a parent, it can be tough to keep track of, but it’s important to try and keep up to date on the ways your kids communicate. Not only can it help to keep them out of harm’s way, but it can also prevent them from giving away too much personal information to apps and fly-by-night developers. The age of texting has already come and gone — kids spend just as much or more time using in-app messaging services as they might with traditional SMS messaging. That can make it harder to keep a watchful eye on your child, making it more vital for you to communicate with them and to establish proper guidelines. It can be tough to balance a child’s privacy — which is important — and your desire to protect them. An essential part of enabling your kids to use technology safely, smartly, and without endangering themselves is to teach them good practices from an early age. That includes things as fundamental as password security. Think about the first time you set up a password for them: it was probably something short, simple to type, and easy to remember. While that works well at an early age, it’s important to teach your children that the rules change as they get older. Strong passwords should become the norm — and they should never share them with friends. Not sharing passwords is an especially important rule, as it appears more children continue to experience firsthand the dangers of password-sharing. In one instance we know about, one child who became upset with another logged into a Snapchat account that was not theirs. They then proceeded to make highly offensive posts — which subsequently caused all kinds of problems in their school. As you can imagine, this not only creates a terrible atmosphere for the children involved, but it can also enable bullying and foster endless unnecessary drama between kids. There’s never a good reason to share passwords, and that’s a valuable lesson to share with your children. While we’re on that subject, don’t give your children access to your primary accounts or the administrative passwords to your computer. As we’ve talked about in the past, separate your child’s usage onto separate accounts with limited functionality. In other words, help them help themselves avoid trouble. By creating an environment where it’s clearly understood what you should and shouldn’t do with computers, it’s easier to teach lessons that make sense to your kids — and those are the ones that stick. Games have come a long way from the days of Pong, Duck Hunt, and Donkey Kong — and they’re more of a fixture in our kids’ lives than ever before. With games wrapped up more and more in social aspects and with multiplayer communities thriving all over the Internet, it’s an area of interest for many kids. It’s also one of the biggest potential avenues for problems, too. As a result, we’ll need to drill down on this subject. In the “old days,” multiplayer meant sitting next to your friend on the couch at their house. Now, network connectivity and high-speed Internet transmission allows people to play games with other individuals across the world. Voice chat, though it’s been a fixture for several years, has exploded more recently and become an integral part of the experience for many players. Abuse of voice chat is a rampant problem in its own right, with trash-talking often reaching hair-raising levels of profanity. It’s been a major problem for some companies as they cannot police all voice chat all the time, but must still find ways to try and stem the tide of abuse. It’s not only voice chat that can be problematic and expose your kids to things you’d rather they not experience. One thing we’ve seen recently concerns the game Minecraft, a fun and popular game with fans in all age groups. A key part of the game is its ability to allow players to join together in creating a shared digital world — sort of like a big multiplayer version of the Lego sets you knew as a kid. To that end, you can host your own game server and invite others to come in and play. It’s not uncommon for kids today to have one or several favorite Minecraft servers they like to visit. Unfortunately, not all server operators are as scrupulous as we’d hope. It turns out that some Minecraft servers have demanded users install and run screen-sharing software. They do this under the guise of checking to ensure users aren’t running cheats or hacks for the game — otherwise, they won’t let the user enter. In reality, once they gain control of the user’s mouse, they begin to run all kinds of unwanted software, ultimately aiming to install malware. The premise is innocuous enough that your child might not think twice about allowing access—and now suddenly the family computer has a virus infection! Most of us know that we’re not supposed to let other people control our computers or to install random software, but your kids might not think about it in the moment. That’s especially true when it comes to finding ways to enjoy their games more. What if your child decides to go looking for one of those cheat programs? Tons of sites that claim to host these hacks are serving up cleverly disguised malware. They might download a hack, find out it doesn’t work in the game, and never realize that they just dumped a Trojan horse onto the computer. The same can happen if your children try to pirate a game to avoid paying for it. Remember, most malware authors go out of their way to hide the infection so their creations can linger on the machine. In these cases, the bad guys aren’t necessarily targeting kids. Instead, they happen to operate in areas where kids can often end up while exploring their online interests. Much of this boils down to kids just not knowing enough about the Internet yet to protect themselves — so it’s up to you to understand how to educate them without condescending and clouding the message. We think it’s important to note that the answer to encountering some of these problems isn’t to take away gaming privileges entirely — not unless that’s a punishment warranted by specific circumstances. In general, there are a lot of opportunities for learning, social development, and even personal growth through playing games cooperatively with other people. As with anything else, it requires knowledge of your child and his or her needs to know how to set boundaries in this area. For most people playing, it’s a positive experience, but be aware of the risks and how to navigate these situations when they do arise. When it comes to ways your kids can stumble into trouble online, it breaks down into two separate categories. The first is the same numbers game that we’ve always talked about on this show: some malicious person out there in the world who pumps out as much malware as possible to score victims wherever and whenever possible. As a result, it’s almost a certainty that your children will encounter one of these tricks or traps at some point in the future. The best way to cope with that issue is to develop your own working knowledge of computer security, relay the relevant information to your children, and help them establish detection patterns that give them a sense of when things aren’t as they seem. Now, the other side of the coin: what if your child has been targeted specifically? While this is less likely to occur, that doesn’t mean it’s not possible. It could be bullying, it could be a malware attack, or it could be something else. While few people are going to target your child on purpose, there are the bad actors out there who will try to prey on their youth and inexperience on the web to either deploy a malware attack or to glean sensitive personal information such as your credit card or social security numbers. The number one thing you can do is the same no matter the situation: work to establish clear and open lines of communication long before anything bad happens. Your goal should be to develop the trust that enables them to come to you without fear when something goes wrong. While no one likes disappointing their parents and they may not share every issue with you, it’s essential that they know when to share information with you for serious concerns. A key component of this strategy is to avoid bringing down the hammer of immediate, swift punishment and anger when they do approach you. Instead, look for ways to solve the problem and prevent it from happening in the future. The next thing to know is to have a general plan in mind for responding to issues as they arise. A cyberbullying issue, for example, may require the involvement of your child’s school. As more institutions seek to improve their guidelines and responses to these problems, it can be a reliable way to seek closure and healing after an upsetting incident. Helping a child navigate these situations can be very complex, and it’s preferable to avoid them altogether, but that isn’t always possible today. Providing your child with a safe and trustworthy outlet can help you approach problems before they grow out of hand. In a security breach situation, hopefully, your child will inform you right away. Keeping your security software up to date and ready to spring into action can make cleaning up this kind of mess a less stressful affair for all involved. Maintaining regular backups to protect your data also means that the amount of potential damage has a ceiling. When you know you can’t lose everything to one simple mistake made by a younger user, it’s easier to work through the problem without anger and frustration. Of course, in some severely serious situations, such as when you suspect your child has been approached by an online predator, the immediate reaction should be to turn to the police. Contending with a ransomware attack doesn’t necessitate reaching for the phone to dial 911, but when other children could be at risk, alerting the authorities is the right thing to do. In any situation where your child comes to you to express a problem, take the time to figure out exactly what happened. Whether it’s a bully or malware, know the facts first — then develop your response. It’s important to talk to your kids about the dangers that exist — not as a scare tactic, but as a reality check. Try to approach them on the level, and don’t treat them like they can’t understand your concern. Remember, they want to have fun and enjoy the web like all their friends are, so your job is to find a way to start the conversation on their times. Ultimately, this circles back to making determinations about whether your kids are old enough to use the Internet responsibly, or to play certain games, or to access specific apps. Think critically and be prepared to revisit these conversations more than once. With all these concerns swirling around, it’s natural to start thinking about how you can keep tabs on your kids online. So, what about monitoring options — is this something you should even consider? There is a lot of monitoring software for computers out there, though that’s not quite the case with the iPhone. That would require jailbreaking and installing untrustworthy software, and that’s not something you should be doing. In fact, we don’t recommend turning to child monitoring software in general. Remember this: although kids can do foolish things sometimes, they aren’t dumb. Putting up barriers like this only encourages kids to sneak around more than they’re already inclined to do, and that erodes those open lines of communication we’ve talked about today. Think back again to when you were a kid: did you really tell your parents everything you did? It’s not reasonable to expect your child to cop to everything all the time – they’re their own person, after all, and sometimes that means learning by making mistakes. It’s our job to try to and ensure they avoid those mistakes as much as possible, but it must be done with an appropriate balance. That’s why trying to secretly monitor your kids can be even worse — what if it comes out that you’ve been practically spying on their every online move this whole time? It’s easy to think that you’re doing it for your child’s own protection. However, if you ever have to show them something you discovered from your monitoring, it can, and likely will, create a confrontational situation with them, and may erode their ability to trust you. It can take a long time – if ever – to earn back the trust you lost by spying. It also boosts the likelihood that they will try harder to avoid detection next time. If you must monitor, make it clear that you’re watching — don’t try to do it secretly. Sometimes, even informing your children that you’ll be keeping an eye on their online activities can be enough incentive to help them stick to appropriate digital behavior. Perhaps let them know that it’s to keep bad people away from them, not to spy on them directly – letting them know you’re simply trying to keep them safe. Be aware of what’s going on in your family and know when it might be time to step in. That’s not to say to ignore parental controls completely; those can still offer excellent functionality when you want to mitigate risks or control access especially for younger children. In fact, we’ve discussed some of those pros and cons in previous episodes; we’ve even gone over how you can tweak your Mac to help keep your kids safer. Having access to resources that allow you to learn more about what’s out there can give you the tools necessary to start having those important conversations with your kids. Are you thinking that you’ll need a great resource to get you started? You’ll find it right here with the complete archives of all our episodes. While some focus on the news of the day, we’ve covered lots of topics that can equip you with everything you need to know for keeping you and your family safe on the Web. Questions, comments, or concerns you’d like to hear us address on a future episode of the show? You can drop us a line at Checklist@SecureMac.com with everything you want to say. As always, thanks for joining us for this week’s discussion. 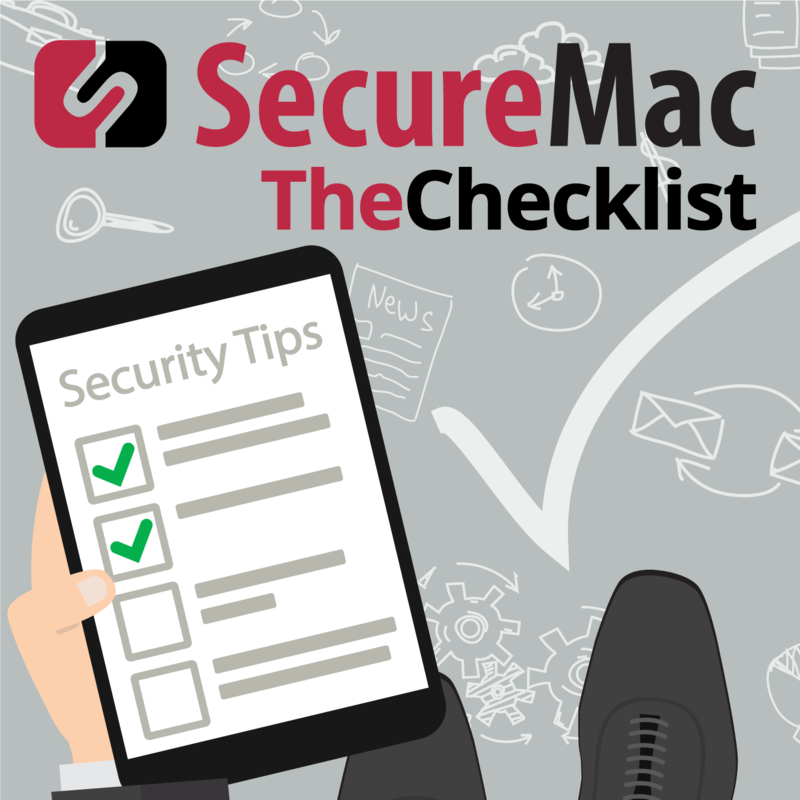 We’ll be back next week with another episode of The Checklist, brought to you by SecureMac.